In 2014, I repeated the theme of change with paintings (3 each) reflecting each season. 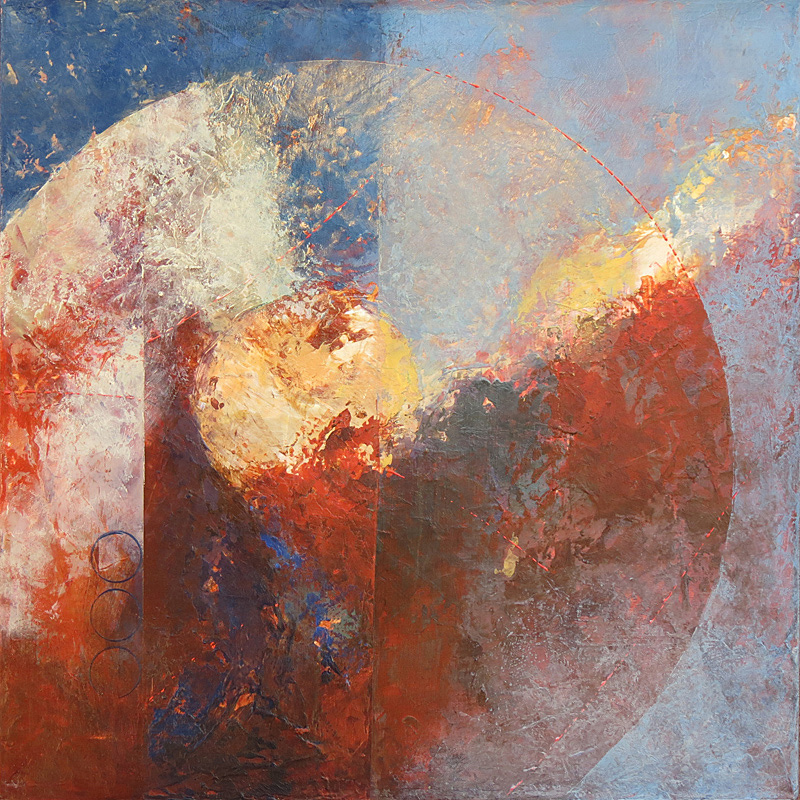 The remaining paintings include 2 large paintings about celestial activity, two about the end of the Mayan calendar (2012), a vertical and horizontal view of S F Sun Series V, and from 2007, Peach Season. William ended dialysis in April, 2015, dying peacefully at home, and after 7 months, I resumed painting with Life Triad. Some of the older paintings, chosen for color, were repurposed as a support and beginnings for the newer paintings of 2016-17. In 2014, I continued the themes of the Seasons, and began to explore the use of iridescent paints finally bridging into "Everything is Illuminated the following year. Cycles of energy, rest and renewal, welcomed and experienced by us all, remind us that everything changes. Somewhere in there though, glowing steadily, is the core of being . Many levels exist in the quiet colors of winter. Below the white snow, life continues, the earth and water maintaining life until spring. Above the surface of the earth, the Moon, representing the feminine aspect of being and creativity. and the sky expressing the movement of clouds with wind and moisture are nurturing the dormant earth within the longer darkness of night. The second month of Spring brings a peeking of color in hyacinths, tulips, and daffodils, and the freshness of moist earth and warmer air! May and June in the garden - astonishing blooming! The earth is alive with energy in July and August, and much activity is beneath the earth, expressed by the movement of coppery worms and invisibilia, and warm and sudden rains. 24 x 30" | Acrylic on Canvas | $1800. Anticipation of awakening, energy dreaming of spring and the next cycle of being. The energy has been resting and gathering to prepare for its next level of being, of creating, of passionate rebirth. The circle of Autumn turns with the reds and golds pressed against the sky. Stillness approaches as autumn turns toward winter, the coolness of grays and blues engulf the gaudy autumn. The drying of the earlier growth of the year becomes evident in August-September and green moves toward bronze and red tinges in the grasses. In 2013 when William was diagnosed with renal failure I had already launched the series A Year of Months-Meditations, committed to painting a 36x48" painting each month during the month, about the month. That choice kept me grounded and in my painting practice as he began and continued with dialysis, though I did have to put my usually concurrent sculpture practice aside. The joys of July - summer, swimming, night skies, sun and moon, my birthday!! Autumn leaves fall, the air changes, and autumn slides into winter. The long night of memory is December. 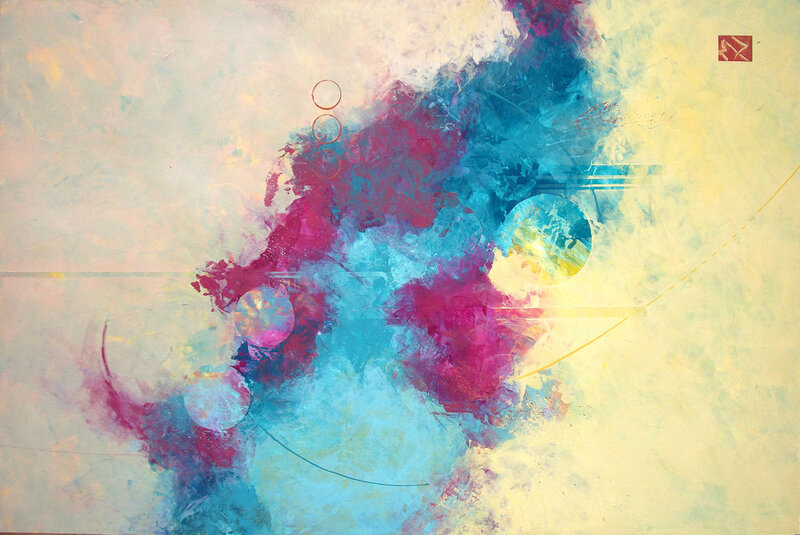 48 x 36" | Acrylic on Canvas | $3300. 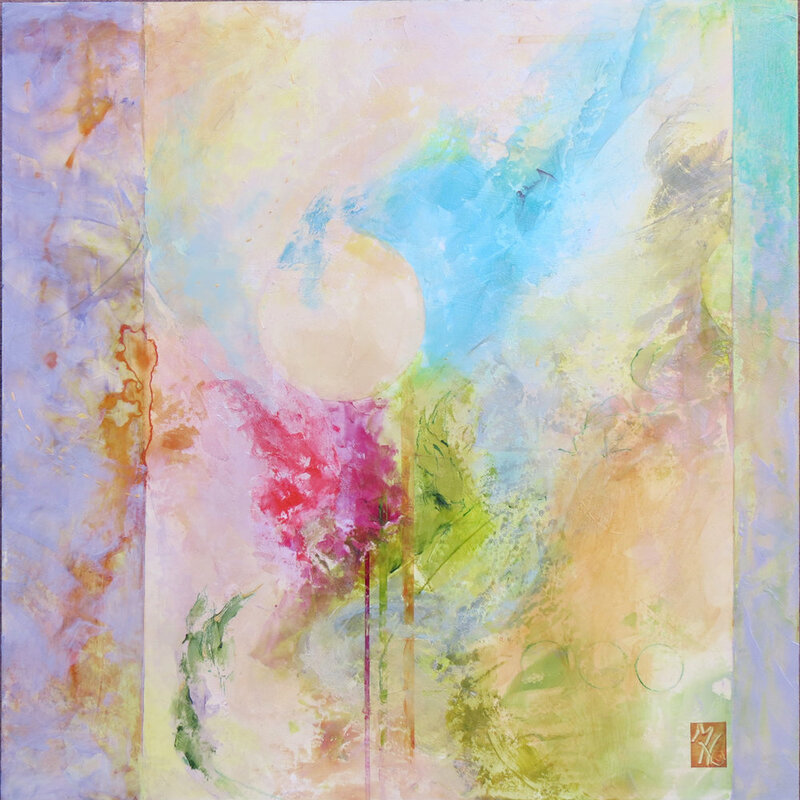 The remaining paintings below include 2 large paintings about celestial activity, two about the end of the Mayan calendar (2012), S F Sun Series V, and from 2007, Peach Season.